ID: Rugged white shell with two inner plates that close. Can grow individually, but often seen in dense clusters growing on top of one another. 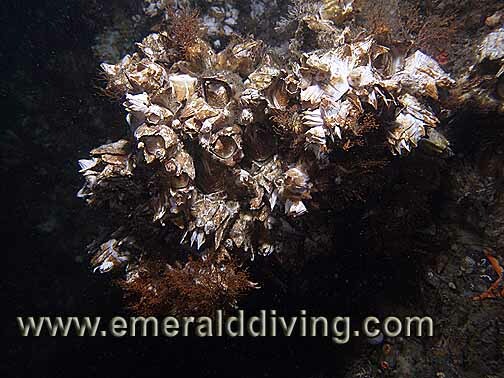 Comments: I often note the robust giant barnacle in rocky reef areas relegated to high current. This animal extends a purple and yellow �net� (actually the animals foot) to trap nutrients passing in the current. I note giant barnacles growing both in isolation and in dense colonies, as pictured here. ID: Exterior shell covered with distinctive white plates. Long neck attaching shell to reef. Grows in dense colonies. 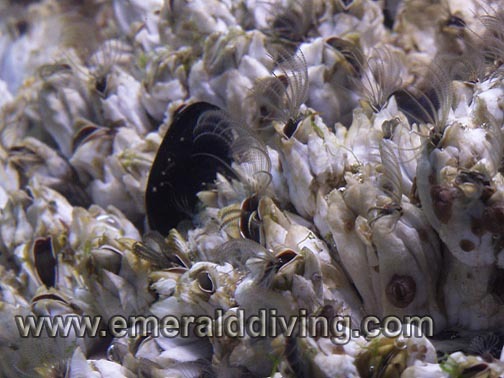 Comments: The extravagent gooseneck barnacle lives in dense colonies on shallow, current swept reefs and walls. I have only noted gooseneck barncales when snorkling around parts of Tatoosh Island. ID: Rugged white shell with a base that is not much wider than the top. Small size. Comments: A very common inhabitant of shallow rocky area. 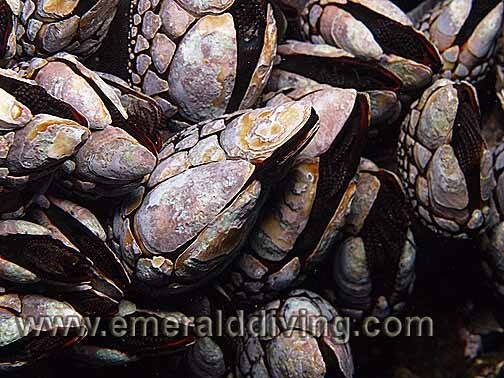 Huge colonies of these animals often dominate rocky shorelines and can survive for some time out of water. 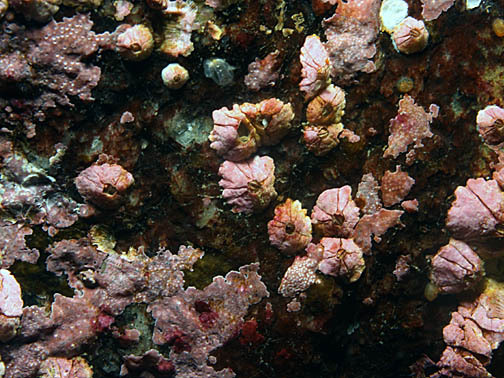 Note that many of the barnacles in this photo are feeding. Photo taken at Pulali Wall in Hood Canal in 3 feet of water. ID: Relaitvely flat and white barncle. Comments: This is the barncle that is often seen attached to discrded bottles and other debris. Photgraphed at Castle Gap in British Columbia.